Update time for the mock to reflect the needs of the Chiefs as they appear with less than a month to the actual event - the 2014 NFL Draft. - For a long time, Odell Beckham, WR; LSU, has been in this spot. After recent epiphanies (the depth of the WR position in the draft, the need for position free versatility in the LB corps, etc. ), Van Noy is now the most logical and needed pick for the Chiefs with their first round selection. Van Noy is the most fluid and instinctual player in this draft. He has an uncanny ability to understand and diagnose a play from it's inception. He finds the ball exceptionally well and takes near perfect angles in pursuit. He's an excellent pass rusher with a variety of moves. He has terrific burst and plays sideline to sideline. He's excellent in coverage as well, showing not only top notch instincts but extremely fluid hips and feet and hands. Van Noy is position independent, capable of lining up at any of the four LB spots. He's also a superb special teams player, blocking numerous kicks/punts over his career. A vocal team leader. Van Noy finishes his college career with the third highest Tackles For Loss in NCAA football history. 223 tackles, 61.5 tfl, 26 sacks, 7 Ints, 21 passes defensed, 11 forced fumbles (with three recovered for TD's). The guy is an impact four down playmaker. Van Noy stood on his combine numbers at the BYU Pro Day and just worked for teams in positional drills. Has been working out/training at since the Combine. •A very fluid athlete, which is hardly surprising when you look at his history. However turning to run in coverage was about as fluid as I've seen from a linebacker. Flips the hips well, and has a good break on the football in coverage. •Active hands. It's unusual to have two positives to start based on coverage, but he really does do a nice job of getting his hands in-between the football and the receiver. •Good change of direction. Really plants that foot and explodes either in pass coverage or in run support. •Excellent awareness. Really has a feel for the game and takes good angles and barely every takes the incorrect first step. •Leader: Showed a lot of character to battle through some injuries in 2013, and was seen as the defensive leader on the field, very vocal and willing to do the dirty work. •Shows a nice array of pass rushing moves, has enough speed to trouble the edge but also mixes in some moves to keep offensive lineman off balance. - The OG position is one of huge need for the Chiefs. While they signed former Indianapolis Colts OL Jeff Linkenbach, there is no one who believes that he's anything more than insurance/depth for the now depleted KC offensive line, which saw the loss of Jon Asamoah and Jeff Schwartz in free agency. Richardson was once considered a first round lock, but you can thank Pitt's Aaron Donald at the Senior Bowl for this gift of a pick. Richardson is an outstanding offensive line prospect with size and power who has played and excelled at both guard and tackle during his time with the Bears. 2013 First Team All-American, All-Conference, Big 12 Offensive Lineman of the Year and finalist for the Outland Trophy. 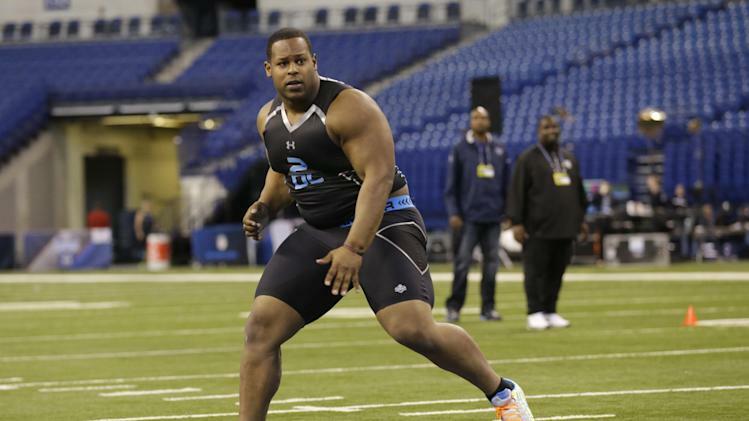 He's got as much potential to be an All-Pro level guard as anyone in this draft. An absolute steal if he is here with this pick for the Chiefs. Richardson ran the 40-yard dash in 5.23 and 5.28 seconds. Richardson, who has 34 3/8-inch arms, did 30 reps of 225 pounds on the bench press (at Baylor's Pro Day). Richardson has lost about 20 pounds since the end of the 2013 season when he was at the Reese’s Senior Bowl. 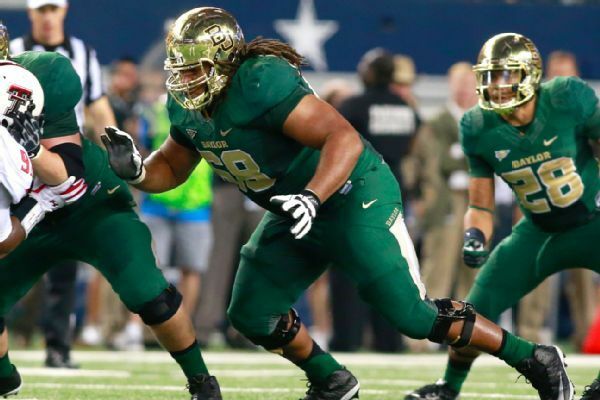 He has worked hard to lose that weight and that hard work paid off at Baylor’s pro day, when he looked very good; he looked like the Richardson we remembered from a year ago when he was one of the most highly regarded offensive line prospects in the nation. He had gotten too heavy in 2013 and did not move well enough to be considered a top line prospect. Now, however, he might have moved back into second-round consideration for the 2014 NFL Draft after falling down into the third-round range with all that weight. - While the Chiefs didn't have much luck with the last Pitt WR they took, Street is a different type of animal. Superb hands, long arms and tireless work ethic, Street is the career receptions leader for Pitt and third all-time in yardage. He highpoints the ball extremely well, and is a crisp, precision route runner with no fear of catching balls over the middle of the field. His size, speed, vertical, route running and hands give him a real shot at being a true #1 WR in a couple of years. At Pitt's Pro Day, scouts timed him at 4.46 in the 40. - The Chiefs really don't have anyone behind Fisher and Stephenson at the offensive tackle position and haven't addressed it/overpaid for it during free agency. Patchan is an enigma. He literally could be one the best offensive tackles in this draft. He was a highly sought after prep recruit (top 50 overall/top 5 OL prospect) that originally signed with Miami. He's an absolute freak athletically (compares very well to both Fisher and Stephenson in that regard). Has excellent footwork, very good hands and is incredible at getting into the second level. Plays nasty. However, he's hardly ever been on the field due to a series of freak accidents unrelated to football including not one, but two scooter crashes and getting shot in the shoulder in a Miami park as a bystander as well as numerous football related injuries that include a torn pec, ACL, wrist, etc. 2013 was really the first time that he played a full college season and he was rewarded with a 2nd Team All-Conference nod and multiple Conference Offensive Line Player of the Week Awards. You just can't overlook this level of athleticism. The tools and attitude are there. Highly impressive raw numbers from the combine…Terrific athlete in the straight-line with some explosive characteristics…Can lead block down the field with the mobility of most tight ends…Takes sharp angles down the field and is very rangy…Plays with eyes up to see moving defenders, aids effectiveness as a combo blocker or handling stunts in pass protection…Places hands well to keep them inside the frame of defenders…Is a sticky blocker who’s tough to disengage from if he stays balanced on contact…Explodes off the ball as a power run blocker and can drop pads well enough into contact…Can deliver highly impactful blocks with a heavy punch…Will finish by driving defenders into the ground, great mentality…Son of an NFL offensive lineman. 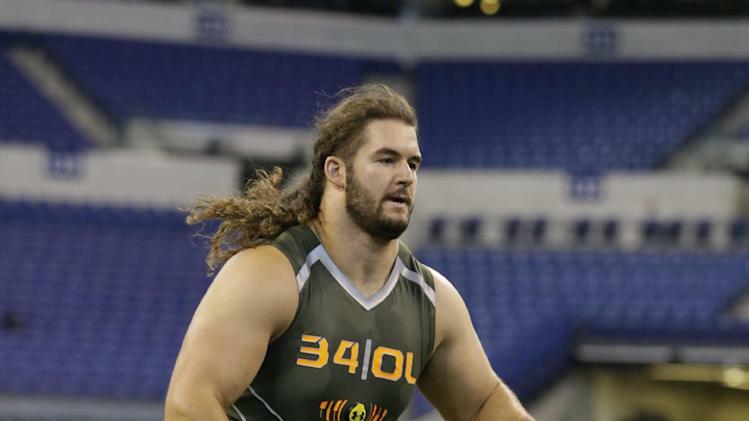 Looks the part of an NFL offensive tackle with broad shoulders, long arms and a trim middle. Very good initial quickness off the snap, firing off the ball when run-blocking to turn and seal his opponent from the action. Surprising straight-line speed to get to the second level and shows good lateral agility and body control to adjust to moving targets. Easy athleticism is apparent in pass protection, as well, showing the balance and fluidity to remain outside in the NFL, perhaps even at left tackle (as he played for BC). Plays with good knee bend and on the balls of his feet, showing the ability to slide laterally, keeping his shoulders square to the defender. Latches onto opponents and shows good strength in his hands to control once engaged. Undeniable talent whose question marks are largely off the field. - For some reason, the Chiefs FO/coaching staff just hasn't dedicated the backup NT spot to Jerrell "The Landshark" Powe. As such, there is a perceived hole behind Dontari Poe as the two down NT. The word "massive" is apropos describing Carrethers, who is literally built like a sequoia tree trunk. The really nice thing that he does well is he's very instinctive in finding the ball carrier evidenced by having one game where he had more tackles in a single game than any other defensive lineman in college in 2013 (16 tackles). First team All-Conference. 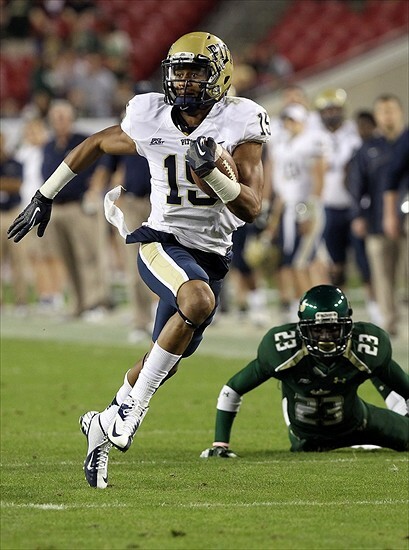 - Johnson is an athletic, heady player who has played all over the Wolfpack defense including CB, OLB, SS and FS. While the Chiefs have added Jerron McMillian at S and Chris Owens at CB to the 2014 roster, Johnson gives them a player who will be able to play either slot effectively. Would be a great addition in terms of depth and special teams play. Last edited by Saccopoo; 04-14-2014 at 03:47 PM..
Fuller was pretty darn good in that game. He was caught out of position more than a few times, but he had the athleticism and instincts to correct himself right in time to make a play on the ball. There were a couple of passes were he didn't have any right to be involved in the play after the way he misplayed the WR, but he came back to swat the ball away anyway. Combine his natural instincts with improved awareness immediately after the snap and he could be a real player. Tamba is likely on his last year of being a force at passrusher. Love the guy, but he's bound to lose a step. And FFS, can we get some receivers in here? LEGIT receivers not named Bowe? The first part I disagree with, since I don't think his pass rushing has ever been predicated on athleticism or burst. He is all about skill, leverage, and relentlessness. His skills will do nothing but improve. He's like Jason Kidd. When you start your hall of fame career with layups, your game doesn't suffer when you lose your dunk. The second part I agree with wholeheartedly. I will be really surprised if our first round pick this year isn't a pass catcher, either WR or TE. Does that first round Tight End play basketball in college and have the most reliable hands in the history of the position? The more I think about it, the more I want us to find a way to move up for Marquis Lee. He was having a marvelous season to that point. I thought about mocking HaHa Dix to the Chiefs in the first, but there is no way in hell I'm coming off of Gabe Jackson. That train is rolling right into the Draft 2014 station. Safety is not a concern. You think? That would be amazing. The dude is legit and teams will regret passing over him. Put his first five week stats up against any college QB. It's nice not scouting college players each week more than watching the Chiefs.